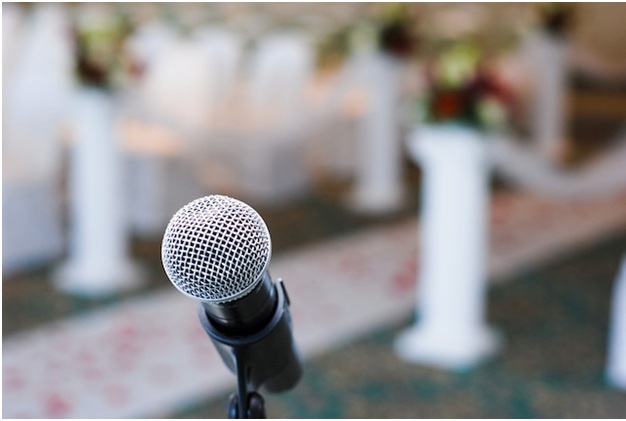 How to choose a Master of Ceremonies (MC) for your wedding? Why have an MC at the wedding? Most of the time, we at WeddingVenture.com observe couples asking one of their friends or relatives to perform the duties of an MC (sometimes, this responsibility falls onto the best man). This is, of course, the most cost effective option. Another reason to prefer a close friend to act as an MC is because the bride and the groom want a more personal and unique wedding experience. After all, a paid professional will use a predefined "script" to run through the evening and will only have the same old standard old jokes you've heard at all other weddings. That is understandable and forgivable - a hired MC will not know the bridal party and guests well enough to provide a truly personal approach. On the other hand, because a professional Master of Ceremonies has gone through tens or hundreds of weddings, they will most likely offer a much "smoother" wedding experience, the jokes will be well-tested, and the expert will be better with time management. If you decide to have your friend or relative act as a Master of Ceremonies, choose someone who is easygoing, comfortable in large crowd and has plenty of public speaking experience (especially with large audiences). Being an MC is a big responsibility, so even if your potential MC has public speaking experience and has known all of your guests for a very long time (i.e. is among close friends), they will likely still feel jitters simply from the weight of the responsibility you put on them. When choosing your MC, look for someone responsible and accountable who has demonstrated these traits consistently in the past. The last thing you want is for your MC (who may be a charismatic "social butterfly" that enjoys public speaking) is to get side-tracked by the food, wine and good company and even fall asleep on a couch outside the reception (you may laugh, but this has happened in the past!). Finally, it's great when your MC of choice has a good sense of humor and can insert jokes into their speeches. It's not so great if they are the only ones who find those jokes funny, or better yet, when the jokes offend someone in the audience ("Dear Steve! Let's hope you won't cheat on your new wife the way you cheated on your previous girlfriend"). The best way to avoid these or any other potential pitfalls is to either review (and revise) your MC's speech well in advance, or, if you want the MC's speech to remain a surprise to you, enlist a few trustworthy friends or relatives to help review different parts of the speech. Whomever you hire or invite to be your Master of Ceremonies, be it a professional MC or a friend, walk through the entire wedding day with them multiple times to ensure you have the same vision of what your big day looks like to avoid any unpleasant surprises.